The remains of a one-year-old boy who died 12,600 years ago in what’s now Montana are giving up exceptional information about the place his people held in American history, and the origins of Native Americans on both continents of the New World. First discovered in 1968 on the Anzick family ranch near Wilsall, Montana, amid the distinctive biface blades and other tools identified with the Clovis culture, the boy’s remains comprise the only known skeleton to be definitively associated with the Clovis, who lived as much as 13,000 years ago. 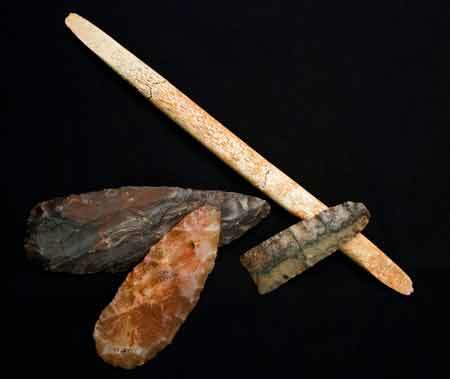 Though many experts believe that they were not the first people to migrate to the Americas, the Clovis may have been the continent’s first widespread indigenous culture, their trademark tools having been found throughout much of North America. Now, an international team of researchers has sequenced the genome of the Anzick boy and compared it with the select genetic information of modern Native Americans across the Americas, as well as with that of ancient Europeans, Asians and Greenlanders. Their results show that approximately 80 percent of today’s Native Americans are direct descendants of the Clovis boy’s contemporaries, particularly the indigenous people who live today in Mexico and South America. The remaining 20 percent are found among some of Canada’s First Nations, who, while not direct descendents of the Clovis, are still more closely related to them than any genetic group from any other continent. “It is almost like finding the ‘missing link’ to the common ancestor of the Native Americans,” said lead researcher Eske Willerslev, of the University of Copenhagen, in a statement. “The Clovis boy’s family is the direct ancestor to roughly estimated 80 percent of all present day Native Americans. Although the Clovis culture disappeared, its people are living today. Among the study’s many findings are that the Anzick boy belonged to a genetic lineage, or haplogroup, known as D4h3a, thought by geneticists to be a sort of founding line for indigenous Americans. But this genetic marker is relatively rare among modern Native Americans, appearing more often in the genes of native South Americans than in northerners. This would suggest greater genetic diversity among Native Americans than some experts expected. This now seems doubtful, because the Clovis boy turns out to share about a third of his genome with another ancient youth, a 24,000-year-old Siberian child known as the Mal’ta boy, whose remains were also recently analyzed. Comparisons with ancient remains from Greenland and Spain showed no such similarity, the team reports. “The genetic findings mesh well with the archaeological evidence to confirm the Asian homeland of the First Americans, more clearly define their genetic heritage, and is consistent with occupation of the Americas a few thousand years before Clovis,” said Texas A&M’s Michael Waters, lead archaeologist on the team, in the statement. “The findings do not support a western European origin of the First Americans as suggested by the Solutrean hypothesis,” he added. The shared similarities — but also the small yet salient differences — among these native groups together suggest that a genetic “split” took place within the Anzick boy’s lineage thousands of years before his time. From one branch of this division came the ancestors of some Canadian First Nations, the researchers say, while the other branch led to the Clovis, Anzick boy and his family, and their descendants who make up the majority of Native America today. “The genetic information provided by the Anzick boy is part of the larger story of modern human dispersal across the Earth and is shedding new light on the last continent to be explored and settled by our species,” Waters said. The team reports its findings in the current issue of the journal Nature. The “Solutrean” hypothesis (SH) does not argue that the “first” Americans came from Europe. It argues strictly that the similarity between specific Solutrean technological practices and Clovis techniques could be the result of a trans-Atlantic transfer. That is profoundly different from arguing that the Americas were first colonized from Europe. This is especially important because most proponents of the SH do not think Clovis were the first humans to enter the Americas. More importantly, many think that the technology after it arrived spread among a population already present on two continents.